Why be curious? 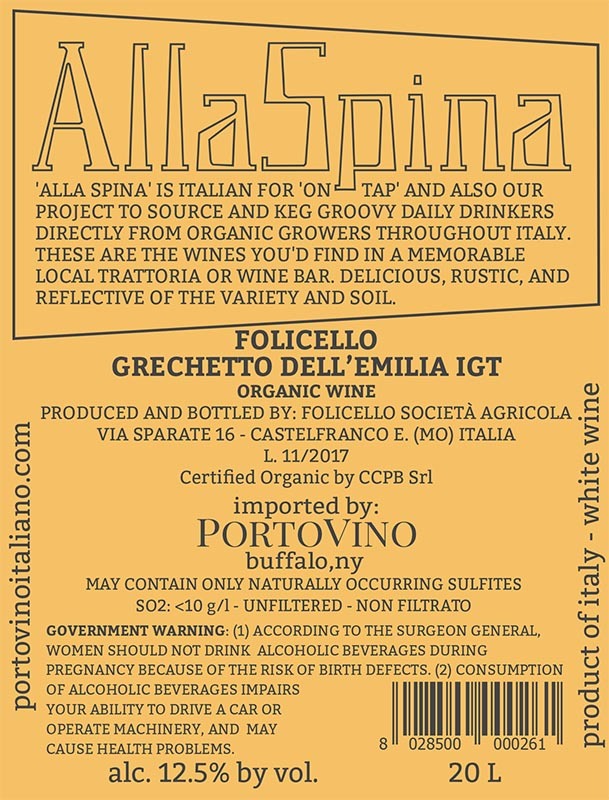 Grechetto, as known as Pignoletto, is a grape variety grown in Emilia-Romagna, a region in central Italy that’s famous for its comfort food, including lasagna. Folicello makes this daily drinker. Lemon, a touch of lavender, and almond notes. Excellent as an aperitivo. The wine can be a bit cloudy, since it’s not filtered – it’s a good thing! Denominazione / Appellation: Pignoletto Reno. Ettari / Hectares: 2 Ha. Quota / Altitude: 50 m / 164 ft.
Suoli / Type of soils: Clay. Età delle viti / Vine age: 5 years old. Allevamento / Trellis system: Cordone speronato and Guyot. Data di vendemmia / Harvest date: From the end of August to the first half of September. Resa / Yield: from 8000 to 10000 kilograms / hectare. Fermentazione alcolica / Alcoholic fermentation: 20 days in stainless steel tanks, at 16-18°C. Fermentazione malolattica / Malolactic fermentation: Yes, during fermentation. Affinamento / Élevage: Stainless steel. Zolfo / Sulphur: No sulphur added. Tappo e bottiglia / Closure and bottle: 20L kegs.